The world needs to do more to prepare for the impact of a rapidly ageing population, the UN has warned - particularly in developing countries. 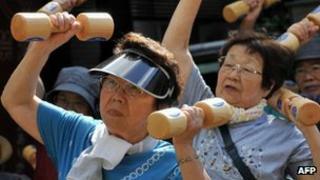 Within 10 years the number of people aged over 60 will pass one billion, a report by the UN Population Fund said. The demographic shift will present huge challenges to countries' welfare, pension and healthcare systems. The UN agency also said more had to be done to tackle "abuse, neglect and violence against older persons". The number of older people worldwide is growing faster than any other age group. The report, Ageing in the 21st Century: A Celebration and a Challenge, estimates that one in nine people around the world are older than 60. The elderly population is expected to swell by 200 million in the next decade to surpass one billion, and reach two billion by 2050. This rising proportion of older people is a consequence of success - improved nutrition, sanitation, healthcare, education and economic well-being are contributing factors, the report says. But the UN and a charity that also contributed to the report, HelpAge International, say the ageing population is being widely mismanaged. "In many developing countries with large populations of young people, the challenge is that governments have not put policies and practices in place to support their current older populations or made enough preparations for 2050," the agencies said in a joint statement. The report warns that the skills and experience of older people are being wasted, with many under-employed and vulnerable to discrimination. HelpAge said more countries needed to introduce pension schemes to ensure economic independence and reduce poverty in old age. It stressed that it was not enough to simply pass legislation - the new schemes needed to be funded properly. The UN report used India as an example, saying it needed to take urgent steps in this area. Almost two-thirds of India's population is under 30. But it also has 100 million elderly people - a figure that is expected to increase threefold by 2050. Traditionally, people in India live in large, extended families and elderly people have been well looked after. But the trend now is to have smaller, nuclear families and many of the country's elderly are finding themselves cast out, says the BBC's Sanjoy Majumder in Delhi. There are more and more cases of physical and mental abuse, including neglect, suffered by the elderly at the hands of their families. It is slowly becoming a widespread social problem, particularly in urban areas, one which India still has not got to grips with, our correspondent says. By contrast, the UN report cited the case of Bolivia as an example of good practice in the developing world. All Bolivians over the age of 60 get a pension that is the equivalent of about $30 (£19) a month. Bolivia suffers from frequent flooding and landslides, and older people there have been organised into "Brigadas Blancas" - White Haired Brigades. They help with preparations for emergencies, and accessing humanitarian aid.